Energy: Renco project in Mozambique for the master plan of the new Gas City – Renco S.p.A. The Client is a state company called ENH that develops the hydrocarbon deposits of the African country. Rome, 21.09.2018 – Renco Energy, a Mozambican Company controlled by Renco S.p.A. in Pesaro, recently signed a Contract with the ENH Group which is a state company found in Mozambique, responsible for the identification and development of the hydrocarbon deposits. 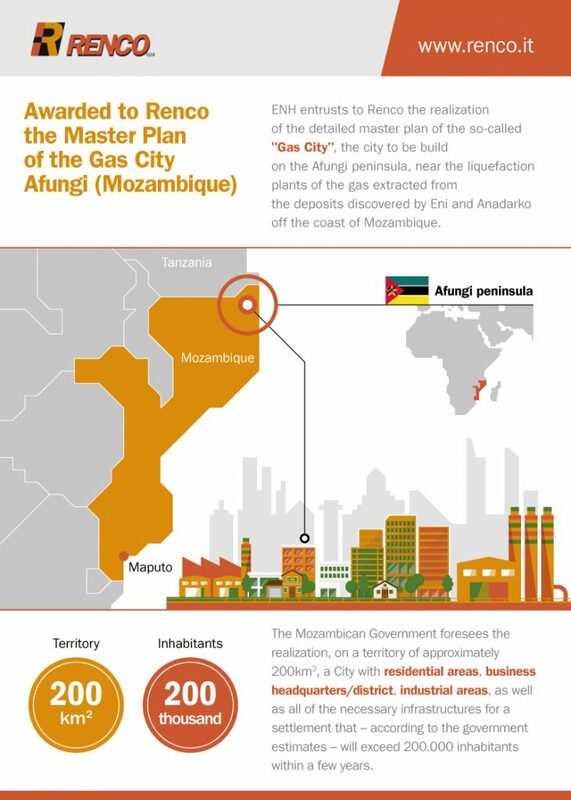 The Contract entrusts Renco with the realization of the detailed Master Plan of the so called “Gas City”, the city that will be created on the Afungi peninsula, in the proximity of the liquefaction plants of the gas extracted from the deposits discovered by Eni and Anadarko on the coasts of Mozambique. The Mozambican Government foresees the realization, on a territory of approximately 200km2, a City with residential areas, business headquarters/district, industrial areas, as well as all of the necessary infrastructures for a settlement that – according to the government estimates – will exceed 200.000 inhabitants within a few years. Renco, present in Mozambique since 2010, should prepare the Master Plan of the area, identify the modality in which the project should be realized (it is foreseen public and private investments), assist ENH with the identification of the financers and implementing parties of the works that will be realized. “We are very pleased with this important responsibility awarded to us. Our competency is recognizable for the elaboration and implementation of complex projects as well as for our ties with Mozambique. In fact, Renco is present in Mozambique since 2010 and has made significant and important investments”, declares the CEO of Renco Mr. Giovanni Rubini. Renco is present on a global scale in over 20 countries with 4.000 employees, the activities of the Pesaro Group is focused on the Energy Sector (Epc, Power production and Services) and building (Development, Construction and Property Management). In 2017 the value of the Renco Group exceeded 248 Million Euro.